The Sanborn Business & Professional Association has chosen H.A. Treichler & Sons greenhouse and farm as the 2012 Sanborn Business of the Year. 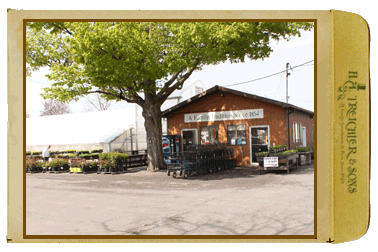 The farm and greenhouse is located at 2687 Saunders Settlement Road (Route 31) in Sanborn and has been family owned and operated since 1854. The business is seventh generation and family run with an impressive family tree, rich in farming history. Brothers Gary and Merv, along with Gary's son, Terry, run the business with a dedicated staff of family members and local workers. During peak season, the greenhouse and farm employ approximately 34 workers. The staff has been dedicated to helping grow the business and most have worked there for many years. H.A. Treichler & Sons greenhouse and farm is impressive in size, with one of the only Pennsylvania-style barns in this part of New York state still being used daily. 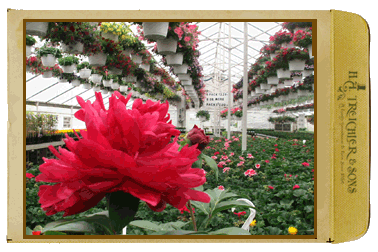 With 227 acres of farmland and 84,000 square feet of covered greenhouses, they produce 30,000 trays of flowers and approximately 250,000 potted plants each year. You can find everything from mums, annuals, perennials, hanging baskets, vegetable plants, shrubs, seeds and decorative items for your garden. Now open for the season, Treichler's will remain open through Halloween, seven days a week. They opened on Friday, April 20 and operate from 9 a.m. to 5 p.m., with extended hours of 8 a.m. to 8 p.m. starting May 1. Staying on top of new farming technology, techniques and plants, as well as listening to what the customers want contributes to the success of the business. Prices stayed the same as last year for pretty much everything, except for a small increase on shrubs. Keeping a middle of the road price point is an important focus of management, concentrating on volume and good quality plants. Mother's Day and Memorial Day are two key holidays that are busy. Hanging baskets and planting flowers for "mom" are always top of mind as a gift option. In recent years, there has been an increase in customers spending time concentrating on home gardens and planting around their yard. Gary Treichler attributes the unusual change in the early warm weather that has people excited about planting this year. Over the years there has also been an increase in road traffic that passes by their business every day. "H.A. Treichler & Sons Greenhouse and Farms have contributed so much to the community and always help out when asked. They are a great neighbor to the Sanborn-Lewiston Farm Museum too," says Bonnie Haskell, president of the Sanborn Business & Professional Association. The Sanborn Business & Professional Association and the Niagara River Region Chamber of Commerce proudly congratulate H.A. Treichler & Sons Greenhouse and Farm as the 2012 Sanborn Business of the Year.